Middle income financial products provider has paid dividend every quarter since 2010. Financial products provider Primerica (NYSE:PRI) announced yesterday its second-quarter dividend of $0.11 per share, the same rate it paid last quarter after raising the payout from $0.08 per share. The board of directors said the quarterly dividend is payable on June 10 to the holders of record at the close of business on May 24. 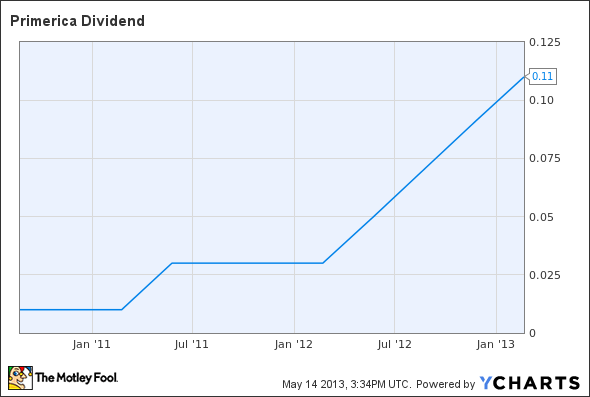 Primerica has paid a quarterly dividend since 2010. The regular dividend payment equates to a $0.44-per-share annual dividend, yielding 1.3% based on the closing price of Primerica's stock on May 13. Investing in Socially Responsible Companies: Primerica, Inc.